I stared at the contents of my grocery bags and thought, “Who would have ever thought that I would come to love fruits, veggies, and healthy food so much?”. As a young girl, the only fruits I ate were bananas, apples, and grapes, and the only veggies I voluntarily ate were carrots. I grew up in the '70s, and '80s when processed food was the new rave. Marketing geniuses led us to believe that “quick” and “easy” were good for us. So, for years, I fed my body that artificial, processed food. Over the past several years, especially as I had babies to train to eat right, I started trying (and craving) new things. For instance, I used to despise anything with the word “berry” in it. Ask my husband. One time when I was newly pregnant, he bought me a strawberry milkshake instead of a vanilla milkshake, and my hormone-driven brain convinced me I had made a huge mistake in marrying someone “who didn’t know me” (we still laugh hysterically about that moment). But now, I eat strawberries as I slice them for my children, and gobble up blueberries as if they were M&Ms. My body now craves good things and actually rejects overly-processed foods. As I thought about all of this, it made me think about Jesus. I didn’t come out of the womb knowing and craving Jesus. I tried lots of things but Jesus. However, once I started filling myself with the things of Jesus (the Bible, prayer, fasting, serving, biblical community), I wanted more of that goodness instead of more of the junk this world tries to sell me with its lure and clever marketing. But, it takes effort and steadfastness, and a “want to.” Just as with my health, I don’t want to fill myself with bad things and feel bad. I want to put good into my body so I can reap the health benefits and be as healthy as I can be—spiritually and physically speaking. A year ago, January 11, 2018, I stood during the Wednesday night service at a church I was visiting out of town. I learned it was their season of prayer and fasting. I felt the Holy Spirit asking me to give up soda...specifically Diet Coke. I drank a Diet Coke every day for the previous 20 years. It isn’t something I needed to survive (even if I felt like I might die without one), nor was it healthy for me. It wasn’t something sinful or illegal, but it had a hold on me. A full year later, I still haven’t had one, and I don’t plan on ever drinking one again (why go back now???). What if we took this year to seek God and ask Him to flush out what we don’t need so that we can fill that space in us with more of the Holy Spirit? What if we spent this year going after the things of Jesus—even if that means laying some stuff aside that we enjoy for a little while to make room for Him? You may realize after a month or two that you don’t miss that stuff after all, and instead, find yourself craving more of Jesus. We can rework our habits, our desires, and our cravings. 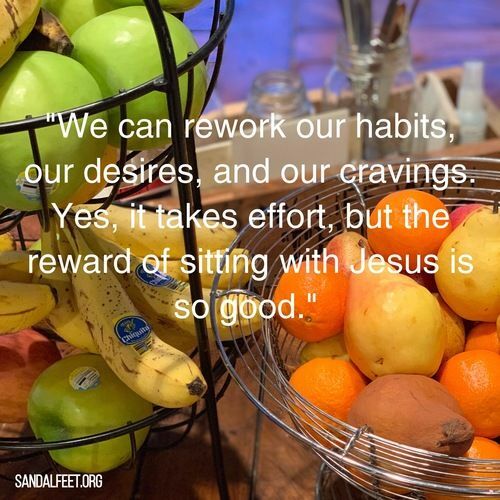 Yes, it takes effort, but the reward of sitting with Jesus is so good. I promise you will have more peace, love, joy, kindness, gentleness, patience, and self-control. You will feel better spiritually, emotionally, and physically. How do I know this? Because it’s what God’s Word says. It’s a promise that those who know Jesus can have the attributes of the Holy Spirit (also known as the “fruit of the Spirit”) and that Jesus heals us and binds up all the things Satan tries to use to bring us down. I won't feel better physically without doing something. Nor will it help if I continue to fill myself with unhealthy food. And for sure, I can’t feel better spiritually and emotionally by filling myself with the junk of this world. I must choose the better (and might I say best) thing. I hope you will, too.